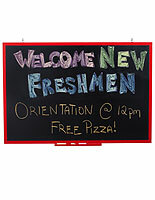 These chalk boards are a great, simple way to leave changeable messages for others, whether it's employees, students or passersby. Each display features a green or black writing surface measuring anywhere from 18" x 24" to 72" x 48". 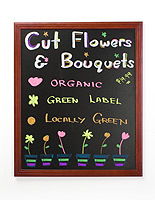 This makes the wall mounting chalk boards, or framed blackboards, an ideal choice for classrooms, board rooms, hallways and lobbies because they can fit anywhere. The chalkboards for schools and offices are great for teaching, setting up meetings, posting announcements or advertising a business. With the chalk boards' easy-change messaging, they can even be used in homes and dorm rooms to keep grocery lists or assign chores. 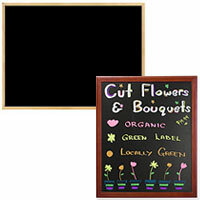 What different types of framed blackboards are available? 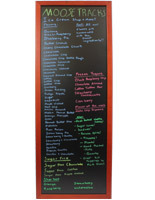 Wall mounted chalk boards are made with either a wood or aluminum frame that is durable enough to last for years. Metal classroom fixtures all feature a neutral silver finish that will match any interior. Wood units can feature a number of finishes, such as red mahogany, oak and a natural light appearance. These framed blackboards for schools come in a number of sizes to fit different locations. In addition to the previously mentioned dimensions, large 19" x 44" and 19" x 56" models are available for generous vertical or horizontal writing surfaces. For a more decorative touch, office fixtures with a rounded end can be used for attractive artwork and messaging. There are two options for writing surfaces, classroom green and the neutral black board. In addition to these choices, some displays come with a cork area for posting notices on paper. 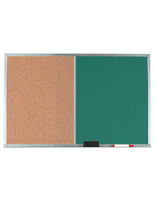 Memos and other notes can be posted with push pins and thumb tacks on the natural tan corkboard. Instead of drawing, users can simply print out pictures when images are needed to convey a message. 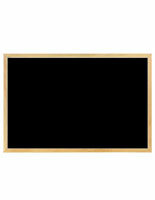 Another option some framed blackboards feature is a convenient tray for writing utensils in schools and offices. These are typically a few inches in depth, and they can be used to hold pens, erasers and other supplies. For users wishing to advertise with their black board may want to purchase a model without a tray for a more professional appearance. These wall mounted boards are excellent for accommodating written messages, paper notices and even writing utensils. With their affordable pricing and fast shipping, the displays will aid communication in places like offices, where notes and visual information are important for productivity. While they are often thought of as classroom fixtures only, they have a broad range of uses outside of schools. 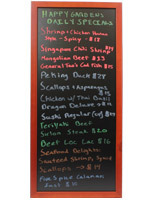 In restaurants, they can act as changeable menus for featuring specials and events. In stores and shops they can advertise new products and sales to bring in passersby from the street. 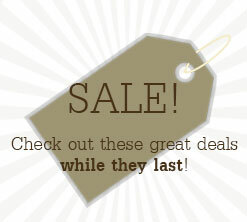 Remember that when using liquid chalk or wet erase markers, they can leave ghosting and other unwanted artifacts.